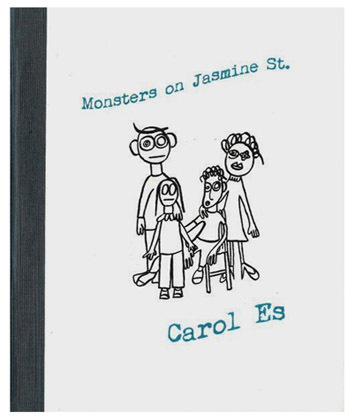 Poems and illustrations by Carol Es, 2011. My first small book of selected poems published by Bottle of Smoke Press is accompanied by five full-color watercolor and ink illustrations and was published January 22, 2011. Book size: 8.5 x 7 inches. (20pp). The cover is letterpress and printed in two colors. These books are limited to an edition of 86 in total: 10 deluxe hardcover signed and originally illustrated copies in a custom slipcase ($100 + shipping); 26 signed and lettered hardcover copies ($30 + shipping); and 50 paperback copies ($10 + shipping), which is a bargain if I've ever heard one. What can I say about this publication other than I am proud and humbled by it at the same time. It is one of my favorite publications here and I'm flattered that Bill Roberts thought well enough of my poetry to publish it.